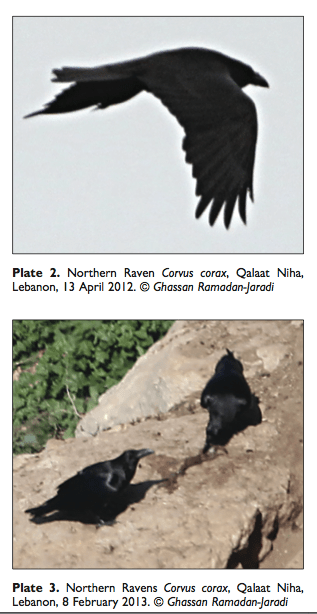 On 13 April 2012 we observed a Northern Raven leaving one of the rocky cliffs at Qalaat Niha, central Lebanon (Plate 1), flying north, but after 100 m he returned cawing to chase away two Short-toed Eagles Circaetus gallicus that were in courtship, with outstretched necks, near the cliffs. We immediately recognized that the Northern Raven (Plate 2) must be defending its nest or chicks but we were still lacking real proof. A visit to the site on 8 February 2013 revealed the presence of five Northern Ravens (Plate 3). On 9 March 2013, we visited the site at 09.30 h with the hope of seeing the bird again but instead we watched a tribe of hyraxes on nearby sunny rocks. However, before we left at 10.45 h, the Northern Raven appeared with a bundle of fine sticks in its beak flying to the same previously frequented cliff. This observation of the carrying of nesting material confirmed breeding by Northern Raven, the first record of breeding by this species for over 43 years in Lebanon. A Northern Raven was seen, by a group of birdwatching trainees, nesting again (carrying food) at Qalaat Niha on 4 April 2014. 14 April 1996; one at Ainab 27 July 1996; and three between Ainab and Hermel 11 August 1996 (Bara in Ramadan-Jaradi & Ramadan- Jaradi 1999). More recently, there have been at least 16 records of Northern Ravens 1998–2006, of which 13 were recorded by staff and volunteers of A Rocha Lebanon (Colin Conroy pers comm). Of them, at least three records suggested that the species is still breeding in the country: a pair at mount Sannine, near Zahleh, 23 February 2000 (see Balmer & Betton 2001), a pair at Tannourine 30 March 2005 (Colin Conroy pers comm) and a pair at Riim/Sannine 18 May 2005 (Richard Prior pers comm). Also the Northern Raven was reported from Bcharri, Beirut river valley, Jabal Arabi, Kefraya, Qadisha, Qaraoun, Ras Baalbek, Tannourine and Wadi el Karn (Ramadan-Jaradi et al 2008). In nearby countries, the Northern Raven is a resident with definite breeding records in Syria (Murdoch & Betton 2008), Israel (Shirihai et al 1999), Jordan (Shirihai et al 1999, Andrews et al 1999) and Turkey (Kirwan et al 1998). We spent two days in the area of Akkar, at the extreme north of the country. During early morning on 7 December 2013 our guide sent us a photo of a Black-winged Kite and hunter. Knowing that this species was last seen in Lebanon at Tyre on 4 December 1863 (Tristram 1882) and at Cedars on 21 September 1954 (Kumerloeve 1972), we rushed to find the hunter in Harar/Akkar village. The bird was alive but stressed (Plate 4) and we noted some blood on its left wing’s secondaries that revealed the presence of a clotted superficial injury on its flank. After negotiation with the hunter, the bird was released and it flew easily away. 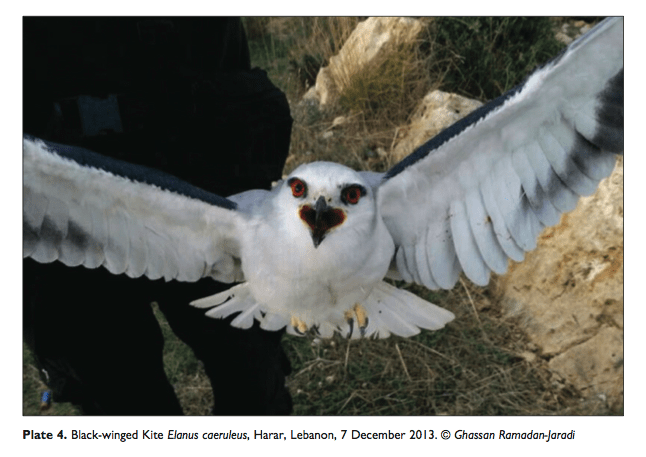 This is the third certain record of Black-winged Kite for Lebanon. The species bred 2011–2012 in Israel (Perlman & Israeli 2013) but has not been recorded from Syria (Murdoch & Betton 2008) or Jordan (Shirihai et al 1999, Andrews et al 1999, Perlman & Israeli 2013). The appearance of this individual could be the first sign of expansion of the species in Lebanon as happened in Iraq in 2001 (Salim 2002), Israel in 2011 (Perlman & Israeli 2013) and in eastern Arabia (Jennings 2010). In the evening of 7 December 2013, we returned to Andqit-Akkar where we spent the night. Early next morning we noted an unusually high intensity of shooting by hunters. Immediately we scanned with our eyes the sky and the landscapes but we could not find unusual birds. While thinking that the hunters were lucky spotting probably woodcocks, five birds flew overhead with typical sandgrouse flight. The contrast with the bright cloudy sky did not allow us to identify all those five individuals but two of them were male Pin-tailed Sandgrouse Pterocles alchata. A hunter that we met on the Andqit plain had two male and a female Black-bellied Sandgrouse Pterocles orientalis and one female Pin-tailed Sandgrouse on a string (Plates 5, 6). We counted c350 Black-bellied and 17 Pin- tailed Sandgrouse in flight in Akkar that day. This is the second record for Black-bellied Sandgrouse in Lebanon (first in 1996, Bara 1998) and the third for Pin-tailed Sandgrouse (second in 1997, Ramadan-Jaradi & Ramadan-Jaradi 1999). 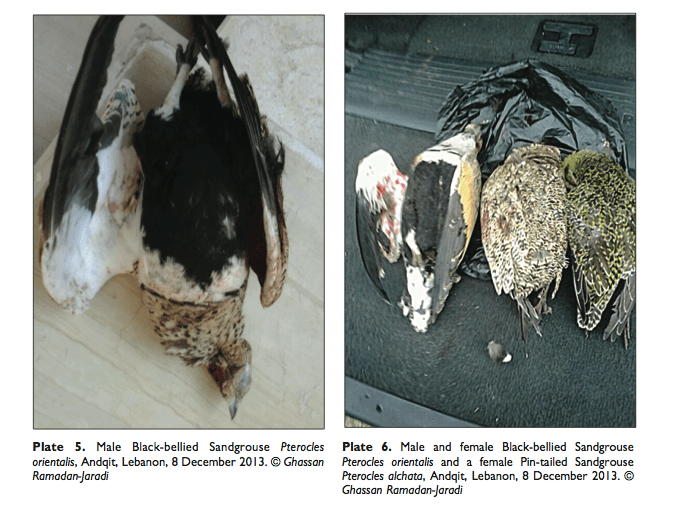 The occurrence of the large number of Sandgrouse preceded the ‘Alexa’ snow storm that hit Lebanon on 10 December. Andrews, IJ, F Khoury & H Shirihai. 1999. Jordan Bird Report 1995-97. Sandgrouse 21: 10–35. Balmer, D & K Betton. 2001. Around the Region. Sandgrouse 23: 156–160. BirdLife International. 2014. Species factsheet: Corvus corax. www.birdlife.org. [Downloaded 06/02/2014]. Jennings, MC. 2010. Atlas of breeding birds of Arabia. Fauna of Arabia 25. Ramadan-Jaradi, G, T Bara & M Ramadan-Jaradi. 2008. 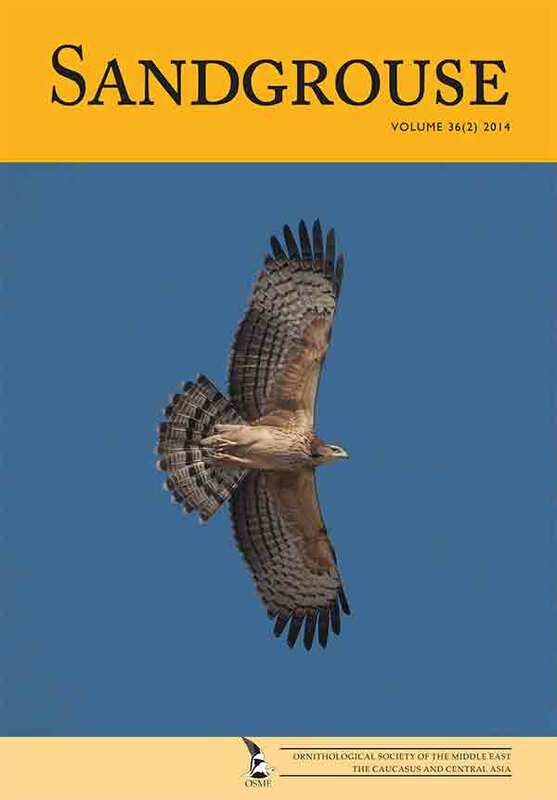 Revised checklist of the birds of Lebanon 1999-2007. Salim, MA. 2002. The first records, including breeding, of Black-winged Kites Elanus caeruleus in Iraq. Shirihai, H, IJ Andrews, G Kirwan & P Davidson. 1999. A checklist of the birds of Israel and Jordan. in 1881. Ibis (IV) 6: 402–419.